The Clone Club is still feeling out the layout of the new season, so this episode is a bit of a slow burn. We’re brought up to speed on Rachel. Sarah is dealing with her worm and Felix problems. And the rest of the satellites are lazily drifting through their orbits. Fortunately James Frain’s Ferdinand comes on the scene to kick this episode in the rear and give it some life. As has become her lot in life, Sarah has too much on her plate. She has a robo-maggot implanted in her jaw and wants it out like yesterday. Her daughter, Kira, is getting moody and has no time for Dungeons and Dragons tabletop games that probably remind her of her father who is trying to track down some blonde chick on HBO. Most aggravating is that her foster brother and longtime running mate Felix is still carrying a grudge and expressing his anger by hanging out with his newly found day drinking bio-sister. The aggravation and stress is starting to wear on Sarah much the same way it wore on Beth in the flashback at the start of the season. Sarah, with Art’s help, pieces a few clues together that lead to a dentist’s office that specializes in implants. 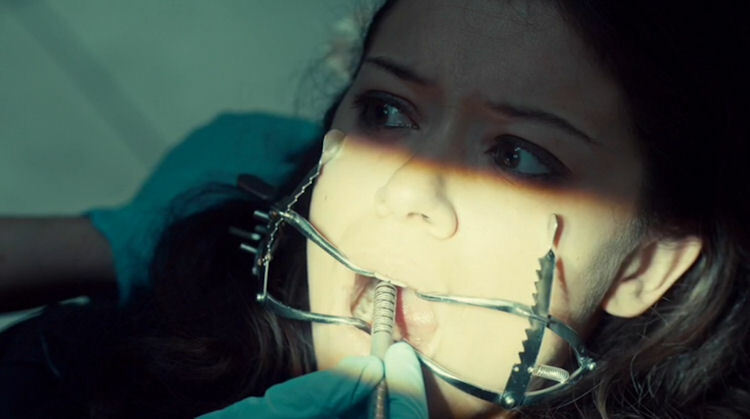 The dentist recognizes Sarah as Beth and agrees to attempt to remove the bug in her jaw. Ferdinand interrupts the procedure, kills the dentist and drops the bomb that Susan Duncan, the mother of the Leda and Castor projects is alive. The device in Sarah’s cheek is scientifically fascinating but Cosima does not have clue one what it does or how to get it out. Just to remind us that her health is always a concern, we get a few nervous coughs into the bargain. 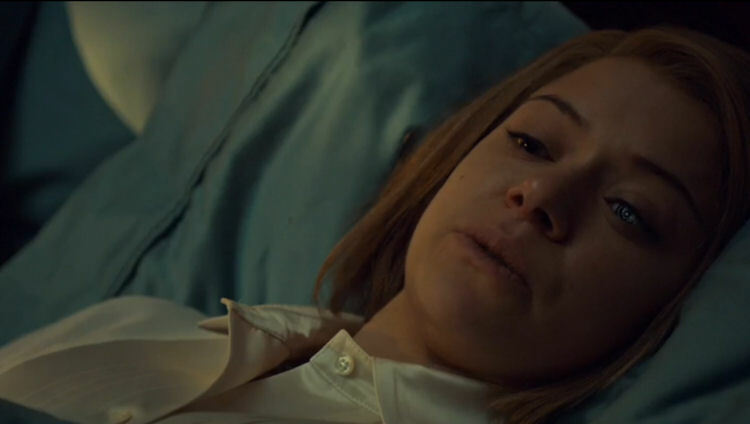 Later on, Cosima interrupts Kira, who is having some kind of precognitive dream about her aunties setting her mom, Sarah, on fire because she was “changing.” Despite being a little kid, Kira has often been the smartest person in the room during previous seasons. There have also been hints that Kira is special in some fantastical way. 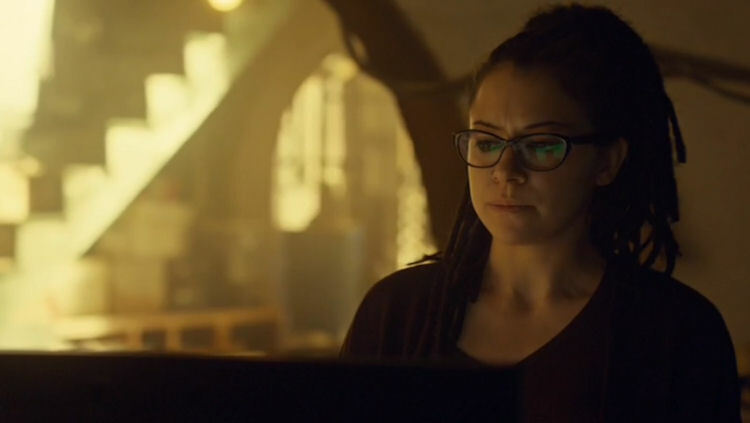 It’s for the best that Kira relayed this experience to Cosima, since this auntie is both the smartest and most spiritual of the group. After Cosima brings Alison up speed on the whole worm thing, Ali has a flash of brilliance. Neolutionists have the worm in the jaws and they have the remains of the head Neolutionist, Aldous Leekie, buried under their garage. Therefore, he’s bound to have a worm that Cosima can study. How difficult or gross could it be to unearth a body that’s been rotting for a few months? As it turns out, exactly as difficult and gross as it seems. After Alison and Donnie lose a few meals, Leekie’s head still has its worm. The pair glaze over the details about how they got the worm with Cosima, but you can’t stop the march of science. Helena is still spreading the news about her bundles of joy. However, she does admit to her own twin, Sarah, she is scared because she doesn’t want her babies to end up like her. A food coma is interrupted by a knock at the door. Some police detectives are outside. Alison’s school board election materials were found at the scene of a triple homicide (the victims were Alison’s drug connection and whom Helena did the murdering of). Donnie walks in on the questioning and does his best to bluff his way through for Helena. As it turns out Helena is more than a trained killer and remorseless eating machine. When pressed by the cops to give specific answers herself, Helena (posing as Alison) rattles off all the correct names from the campaign and the crisis is averted. This is the first we’ve seen of Rachel in a while. She’s adjusting to her creepy cybernetic eye and learning to walk again. Despite all these great things, Rachel is about as grumpy as Sarah right now. Even the most well-appointed prison in the world is still a prison, and that is where Rachel and the second generation clone Charlotte are at the moment. Rachel is also coming to grips with the fact that that the mother who was presumed dead is very much alive and is the real force behind Neolution. Mix that in with the realization that in essence Rachel was abandoned to be raised by a corporation and her mother raised one of the Castor clones instead – her current foul mood is understandable. Rachel has never been one to let obstacles get in her way and that continues now. Rachel and Charlotte are in cahoots together, taking advantage of Charlotte’s access to the internet to send messages to the outside world. Before the episode closes, Dr. Mrs. Duncan sits by Rachel’s bedside and offers an apology of sorts. She wanted to be Rachel’s mother, but the science and the cause of Neolution demanded another choice to follow the path in controlling the next step of human evolution.